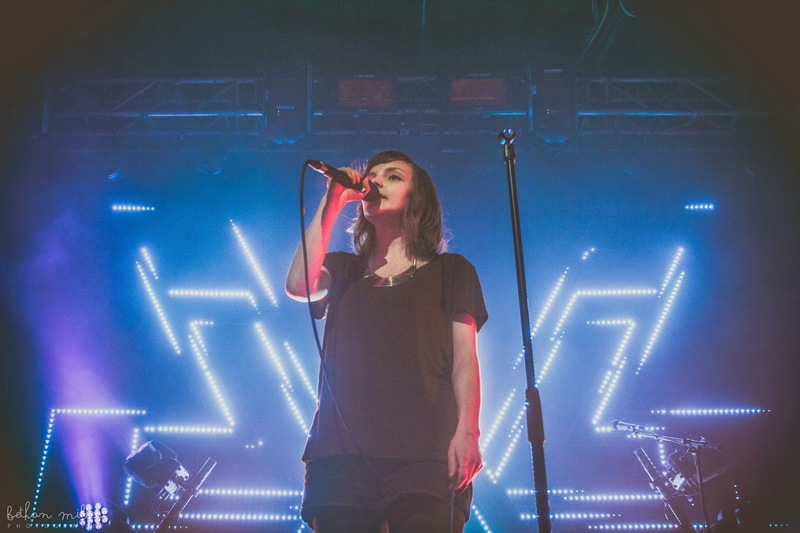 It's crazy to think that just over a year ago Chvrches were relatively only known amongst a small collective of dedicated fans. In such a short space of time they've propelled from the underground with such a force it's hard to believe anyone is still yet to hear their sound, which is pretty self explanatory when you see the words 'sold out' sprawled across their current and previous UK tours. Following on from their critically acclaimed debut album 'The Bones of What You Believe' the Scottish trio finally make their way across the boarder and on to Welsh soil as they take to play Cardiff's Student Union. Support for the evening came in the form of 17-year-old Bridie Monds-Watson, a female singer-songwriter who's quickly beginning to kick up a storm with her assured blend of simplistic acoustic nuances under the moniker SOAK. Recently becoming the debut signee to Chvrches' very own 'Goodbye Records' the young female songstress proves to be quite the contrast in musical styles, although amongst the ignorant chit-chat it's hard to fully let go of your inhibitions and lose yourself in the music. This doesn't seem to phase her though as she battles through an endearing performance to warmly received cheers. As brittle guitar notes cascade over the crowd it's SOAKS empowering yet charmful vocal talents that get heads turning as her pitch perfect harmonies echo around the room. Playing through an encapsulating 30 minute set it's safe to say there is a lot more tricks up her sleeve to follow on from the single Blud that's released on Monday. We can't wait! As 9pm rolls around and the lights finally dim the room fills with cries of excitement and anticipation before the pulsating basslines of We Sink deliver all of their worth. 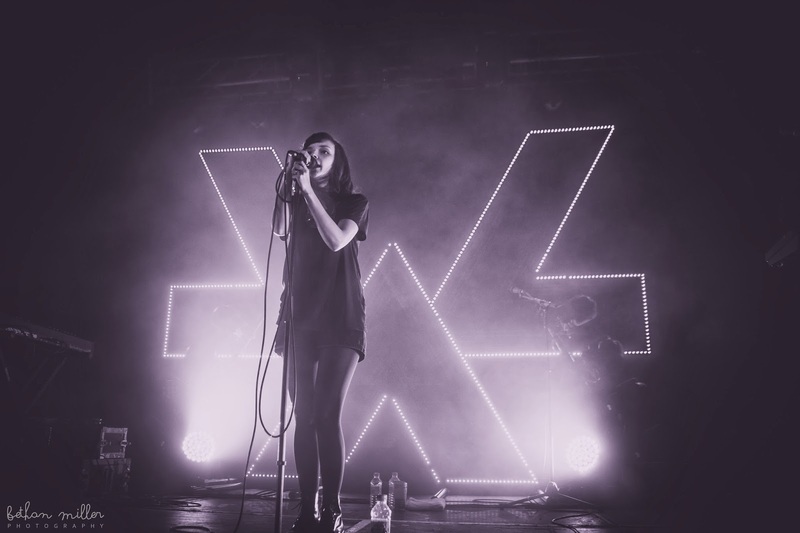 The last time I saw Chvrches was back in February 2013 at Bristol's Thekla and it looks like they've invested in a fancy new backdrop since then. The only down side is every time it changes to a different colour people wanted a photo so out came the camera phones, much to the disapproval of the loved up couple in front of me. If only they could see the look of disgust on my face every time they kissed, which just so happened to be on average 4 times per song, urgh. How long until they ban public displays of affection? It's 3 songs in before Lauren Mayberry acknowledges the audience as she introduces the band. There's something lovable about her stage presence/banter, no matter how many wide eyed smiling faces are present it comes across naturally as if casually chatting to friends. And the same runs true to their performance abilities as Gun and Night Sky wreak havoc throughout the room whilst the rather epilepsy inducing backdrop sends glittering shards of light across the bobbing of heads. The thing with electronic music is that it sounds exactly the same live as it does on record yet with more force. What you hear is a superimposed sound that hits with twice the power. There's no fancy gimmicks to hide behind or tonnes of reverb washing out the vocals to an almost inaudible haze. This is crystal clear Synth-Pop at its purest. By the time Martin Doherty steps out form behind his perch to take lead vocals on Under The Tide it's clear to see his passion as his manic dancing creates enough energy on stage to power half of Cardiff alone. A highlight for many. As the chopped up vocal samples of album opener The Mother We Share escalated in to its glorified choruses the crowd reached their highest peak yet as hands touched the sky as if trying to grab hold of the synth stab soundwaves spewing from the speaker arrays. Returning for a two track encore You Caught The Light brought swells of euphoria throughout as the pace calmed to a dizzying sway through the accreting layers of synths before they rounded up with By the Throat. Their name might not hold any religious bearing but from their actions this evening I think it's safe to say Chvrches sure know how to hold a service worth talking about. The band conclude thier UK tour with 2 dates at London's Forum (14/15th March 2014). You can see more photos from Bethan Miller over on her facebook page.